This is a great story about how one of our Orange County families learned to accommodate and include their son, Nickolas, in all of their outdoor activities. In our post on August 11, we reported that the Glennwood Housing Foundation was working hard to collect the additional $1.5 million they needed to close on a deal in Laguna Beach that would provide 45-50 young adults with developmental disabilities a place they can call home. Medical Assistant Schools has recognized the DSAOC Blog as one of the top 30 blogs relating to Down syndrome. The “Top Down Syndrome Blog” award highlights the very best blogs about Down Syndrome on the internet as determined by the internet community. Members of the Self Advocate Council of the National Down Syndrome Congress (NDSC) and the NDSC Youth & Adult Committee support team speak out against the decision of the Academy of Television Arts and Sciences to honor the song “Down Syndrome Girl” with an Emmy award nomination in the category “Outstanding Original Music and Lyrics”. The Prudential Insurance Company of America, based in Newark, NJ, will provide members of the National Down Syndrome Society (NDSS) support in the area of financial literacy as a result of an agreement the two organizations announced on Monday, August 16. Glennwood Housing Foundation must raise $1.5 million by end of August to close deal on assisted living facility in Laguna Beach. The Glennwood Housing Foundation is working hard to collect the additional $1.5 million required to close on a deal in Laguna Beach that would provide 45-50 young adults with developmental disabilities a place they can call home. Posted in Uncategorized | Comments Off on Glennwood Housing Foundation must raise $1.5 million by end of August to close deal on assisted living facility in Laguna Beach. Orange County Bike Camp – in the news! Last week at Soka University in Aliso Viejo, forty people with disabilities between the ages of 8 and 24 years came together to accomplish a goal – to learn to ride a two-wheel bike. The Down Syndrome Association of Orange County (DSAOC) and United Cerebral Palsy-Orange County (UCP-OC) collaborate to bring this week-long camp to Orange County for the individuals our organizations focus on. Twenty campers are from DSAOC and twenty are from UCP. We were thrilled to have a reporter from the OC Register take interest in this program. You can link to the story and photos below. Registration for next year’s camp should open in April of 2011. Posted in Uncategorized | Comments Off on Orange County Bike Camp – in the news! 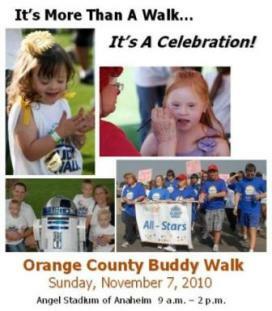 DSAOC is thrilled to announce that the 2010 Orange County Buddy Walk website is now active! Register your team today and help DSAOC spread the word about this exciting event. You can also support a team or an individual walker, or make a general donation. Visit https://www.buddywalk.kintera.org/dsaoc today and help us celebrate the lives of our loved ones with Down syndrome. As you may have heard on the news, there is an epidemic of the Whooping Cough, otherwise known as Pertussis, in California. This year, the pertussis cases reported are the highest in 50 years, even though we are only in August. Whooping Cough is a very contagious disease that can be passed easily from person to person. It is very dangerous for babies.